Have you ever organized a dessert night? This means no soup, no appetizers, no main dishes, only desserts... We were very surprised that we have lots of desserts left at the end of the night, and everyone of us didn't eat that much even though they were heavenly delicious. So, when organizing a dessert night, just make small portions, everyone will be high in sugar at the end. Who can't resist the taste of chocolate eclair? Here I will share a great family recipe made by American friend. She also made in the past, candied yams. 1. In a large bowl, make vanilla pudding according to package instructions. Fold in the Cool Whip. 2. Line bottom with graham crackers in a 9'' x 13'' baking pan. 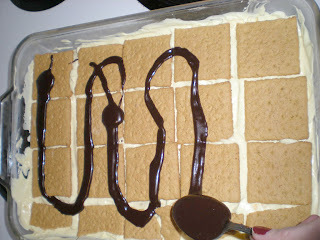 Spread with pudding mixture over the graham crackers. Repeat this process one more time and finish with a graham crackers layer. Refrigerate. 3. Prepare chocolate frosting. 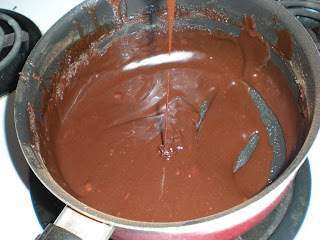 In a saucepan, mix cocoa powder with sugar. Add milk and butter, heat over medium-high heat. Stir until butter melted and let it boil for 1 minute. 4. Remove from heat and add vanilla extract. Stir constantly until it starts to thick, frosting consistency. 5. Spread chocolate frosting on top of the cake. 6. Refrigerate if necessary. Serve. Oh, my, my friend Blanche gave me this same recipe almost 20 years ago. She made the dessert for us and I loved it. Can't believe you had desserts left over. Oh this cake is a thing of beauty, indeed! I have never had dessert night, but my supper club has done "just desserts"! I love how easy this recipe is...thank you for sharing! @ARLENE : It must be an old recipe, my friend's mother have this recipe for over 20 years old too. I was surprised also that after 3 small portions of desserts, we were already full. Definitely a good way to satisfy that éclair craving when you don't have the energy to make choux pastry, or the time to go to the bakery! I've done "appetizer nights", and "cheese nights" but never "dessert nights." I was trying to find what would be the next theme for the next cooking sessions. I didn't thought of having cheese nights, that's a great idea. Thanks Valérie. Thanks for stopping by my blog and I'm glad you like it! 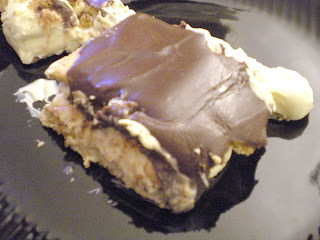 Your chocolate eclair cake looks delicious and I had made that about a year ago. It is hard to stop at one slice! This cake looks and sounds amazing - I love eclairs. eclair is my favorite! !the cake looks delicious and tempting. I love dessert nights! 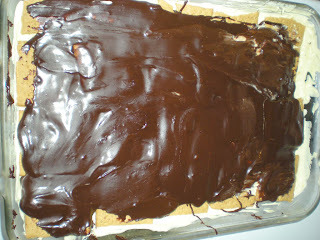 This chocolate eclair cake looks delicious!